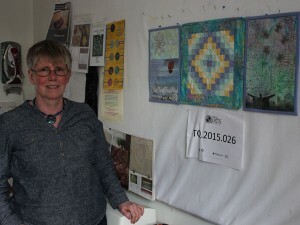 Bonnie’s quilt ‘Celebrating Sam’, is a triptych quilt made to mark the first anniversary of the death of her grandson, who died aged six weeks old. 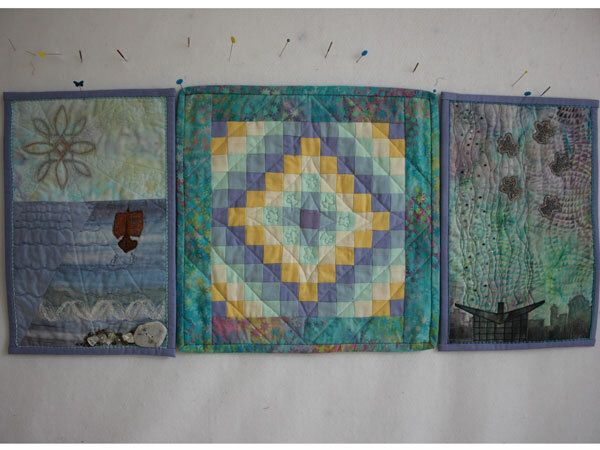 Each of the three panels represents a part of Sam’s life; Bonnie explains these, how she made the quilt and how it has been used. 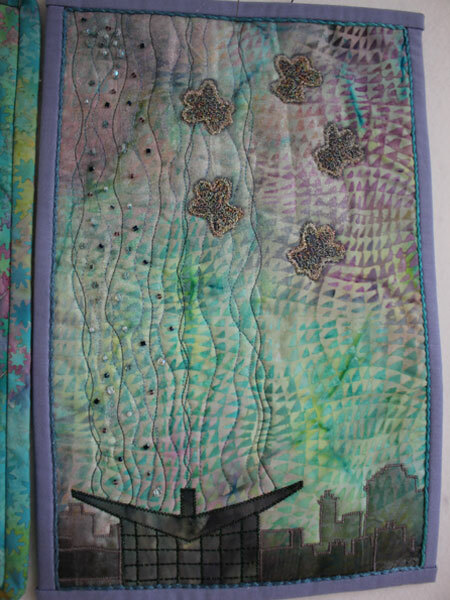 Bonnie’s quilting life is closely linked with her family and she talks about how she got into quilting and what inspires her. She also talks a lot about her role as a quilt teacher, her approach to quilting, her teaching style and the people she teaches. Zoe Aiano [ZA]: This is Zoe here with Bonnie on the 26th May TQ.2015.026 [incorrect, ID number TQ.2015.025] so can we start with your the quilt that you’ve chosen could you tell me a bit about it? Bonnie McKerracher [BM]: Sure um it’s er little triptych called celebrating Sam and [cough] it’s two A4 pieces bookending a square that’s about 14 inches square. They were the three pieces were made to hang together and have never been displayed any other way. Um they weren’t designed to be displayed at all they were designed as a memento for my older daughter to remember her six week old baby who died he was born prematurely, we had him for six weeks and then he died and this is the it shows the three stages of the three most important stages of his life um while we had him so that’s it. ZA: So um why did you decide why why a quilt for this? BM: Erm because I it’s what I do. Um, I have a thing that patchwork feeds the soul and um many times when I’ve been upset or the opposite, very happy, um I’ve worked with fabric and made quilts, um lots and lots of trips around the world you know very simple things. But I can go into my stash after midnight I can decide I want to make a quilt and I can go into my stash after midnight and I can make a quilt you know just from my stash which is not clever and it’s not funny it’s just a fact [BM laughs]. Um so I have memories of um… turning to memories of, of days when I can literally remember cutting fabric and thinking this is the best thing I can do. For instance, the day of the Dunblane, the day after the Dunblane massacre, um where a gunman had gone into a primary school and shot a lot of children, um I was out visiting schools the day the day that happened and the next day I had a quilt to make and I have a vivid memory of standing with all this fabric and just cutting strips and cutting strips and cutting strips and thinking I hope there’s quilters out there in Dunblane who are cutting strips, knowing that they wouldn’t be, but it’s a very soothing thing to do it’s a very accessible art. I never had art in school at all when I was going through school you were streamed to either academics which were science and maths and things or you got to do art and home economics and things like that so I never had any art in school and this is the closest thing I get to it. So it’s, it’s just so accessible, you know, you can make something very satisfying straight from a pattern and get the sheer joy of it without having to worry about designing and things like that so that’s why, that’s why quilts. ZA: Did you pass it onto your family as well? BM: No but it was passed onto me my um paternal grandmother um in Virginia was one of the generation that they aimed to have 12 quilts before they got married um and while I never actually saw her quilting she always crocheted, but she had quilts and she had some quilts that she had made. No, my family were all knitters and crocheters and I came to it with with my best friend. She found this patchwork and quilting class and we used to go out to Pansy Pins on a Wednesday evening and it was a girls night out because we both liked stitching we’d done the Duke of Edinburgh Award together and we’d made our first dresses together and things and this was just a natural progression and we’d both got seriously, seriously hooked [BM laughs] seriously hooked. Her stash is every bit as big as mine [ZA laughs] her room just isn’t [BM laughs]. I don’t know if I answered your question I can’t remember what the question was Zoe I’m sorry. ZA: No the question was actually I meant so your own children did you pass it onto them? BM: No um well they all have quilts but there is this thing that anything Mum can do really isn’t worth doing they could do it better anyway so why bother [BM laughs], you know, um no my oldest daughter is a beautiful knitter and cross stitcher, um my younger daughter is not one bit interested at all she has no soul for it one bit and the irony is her mother-in-law is a much, much better and more prolific quilter than I am [BM laughs]. So she lives in Australia and she’s now her mother-in-law is a fabulous quilter and she has quilts on her bed and things like that that aren’t, aren’t made by me, um and my son er he he he he’ll um do embroideries, he does embroideries we have um a business where we do some embroidered sweatshirts and jumpers and things like that and he does that. Um both Jenny and Michael took art in school and for a long time I would lay out all my fabrics and I would sit ask them if they go together, you know, does this work? You know and I wouldn’t I wouldn’t cut anything until either one or both of these teenagers said ‘yes that’s alright mum’ [BM laughs] so um so that’s, that’s as much as they as much as they’ve passed on. They accept quilts, they like getting quilts you know, um but none of them are very interested in actual actually making them so far anyway you know so… and Catherine never will [BM laughs]. ZA: So after you started taking the classes it seems that then you you found a long a long line of teachers? BM: Yes, yes. When in Pansy Pins about 20 years ago Elspeth Russell hired every American teacher who came over and we were very lucky to get access to all of these great teachers but she also by the time she’d closed the shop, um we had a kind of prize giving for her because she’d actually created eight teachers out of the groups who’d been going who’d gone to her, including me and Carol Judge and um… Catherine Waters and there were there were quite a lot of us who then became teachers through her shop as well. So um yeah and and I still I’m a terrible groupy you know I’ll take a class with anyone who crosses my path [BM laughs] who’s written a book or whose quilts I just love, um I just love classes, I love taking them and I think it’s really important if you teach that you should take classes that are a little bit out of your comfort zone, so that you remember what it’s like to be a student in the class and that’s my excuse for taking classes anyway [BM laughs] so. ZA: And how long have you been teaching yourself? BM: Um since I made my first quilt, um, I think 1995. I did the beginner’s class, the 12 weeks beginner’s class, and um hated most of it because it was all done by hand and it used these quilter’s quarter things and they were just… did hexagons over papers and refused to stuff mine my pin cushion enough so that it would bounce because I knew the seams wouldn’t hold, you know, that kind of thing so you know as soon as I was let loose after that I um found a quilt in a day trip around the world book made a quilt in under a week took it to Elspeth and she said ‘yes will you teach it now?’ so after I made my first quilt I started teaching but I’d done teacher training so that wasn’t, it wasn’t a huge stretch and the book was a class requirement anyway so, so I’ve been teaching ever since. ZA: Who was it you were teaching? BM: I was teaching I was teaching quite um quite a few people in who were customers of Pansy Pins and I also taught in Purely Patchwork. I taught all over the place really, er, including at the textile, um, the textile show down in Jersey so basically anywhere I’m invited I’ll go. I make a point of saying that classes should be fun if people want to become competition quilter’s I’m not the person that they come to, um, my aim is I have this belief that stitching should be stress free, you know, and that’s my excuse for not entering competitions, you know, um and for not doing the full City and Guilds every time I’ve done, I’ve done two short courses for City and Guilds and both of them by the time the assessment came around family complications in the background meant that I was stressed out of my box by the time I was doing the final pieces and so I really have this thing that stitching should be fun. There are people who come to class with me like Irene Watson-Craik who are amazing um textile artists and incredibly precise and um I know to leave them to it I’ve in my basics class I very rarely let anybody take anything out um on the basis that it’ll be good enough you know and in six months’ time you’ll look at this and you’ll say ‘oh haven’t I done better? Haven’t I learned lots?’ you know, that that should be your, you know, your kind of fridge piece so um that’s that’s what I get from teaching and that wasn’t the question either I’m sorry [Bonnie laughs]. ZA: Doesn’t matter, it doesn’t matter. so what are your rules for keeping it fun? ZA: Like do you have techniques that you prefer? Or ways to make it creative? BM: Um we do things quite quickly, um. We don’t do a lot of taking out, a lot of ripping out, we have lots of tea and coffee, even in the Glasgow Gathering, when I set up the Glasgow Gathering the rule was that you brought your own cup because nobody but nobody was going to be doing the washing up. You took your own cup home and you wash it up, well here I have a dishwasher [BM laughs] you know so nobody has to worry about washing up um and… one of the things that I’ve learned is that no matter what my um aim to have finished by the end of the day is it’s that’s not what’s important people have to be able to work at their own pace so nowadays I produce very detailed notes so that those who are comfortable and confident can just rattle their way through without me without a lot of input from me but in when I’m doing a machine quilting workshop for instance it’s like an aerobics course because I’m demonstrating people come they get up they come they watch me they go away, they draw it and they do it themselves and we get eight pieces, eight sections done in a day, um, so that’s really the only one that you know that’s timed, timed to happen like that, most of them are very relaxed and with the notes that I produce I don’t worry if people don’t get to the same… get everything done in the day um. There was one notable night when my family were sitting next door and I kept six people in here until they’d all got their quilt top finished because I couldn’t trust them to finish it [BM laughs] I couldn’t trust the instructions in the book for them that they’d understand the instructions in the book, that was the last time that I ever did that that was that was a huge learning thing for me [BM laughs]. I didn’t see any of them again [BM laughs]. Which is a, which is quite rare but [BM laughs] that was a whole class just gone and never to see, never to be seen again [BM laughs]. So we laugh a lot it’s a very sociable thing um and er I think that there used to be a notion that quilters were wee quiet ladies who sat and sewed you know with their with their pieces on a frame and things like that, some of the conversations in here are just so, so much fun [BM laughs]. There’s one group called the Patchwork Playgroup and that was dubbed because one lady in her sixties said ‘this is just like a playgroup you know’ [BM laughs] ‘you’re just all laughing too much’ [BM laughs] um and they’re most of the groups are like that you know they come here to relax and enjoy and to have and to create you know and that’s I’m really just a facilitator, I give them the space to do that and I feed them tea and coffee and help them cut, or um advise them, or in some cases if one lady’s eyesight wasn’t good enough to do what she really, really wanted to do and I was able to go ahead and finish that piece of applique for her because she was getting so stressed, um, so people come here for different reasons and some of it is purely social, you know, which is great [BM laughs] some days when I’m the best paid tea lady in the business [BM laughs]. ZA: And how about for you personally is it more of a creative thing or a social thing? Or it’s just a happy combination of both? BM: It’s a happy combination of both um I had to create a job for myself, um, I’ve always been self-employed because my younger daughter has this rare chromosome disorder and although I was teacher trained I was trained at a time before job sharing was an option and um living in a big old house I had to be able to contribute to the family income, so I’ve always been self-employed and gradually patchwork and quilting have taken over, um. I’m looking forward to the day when I have to pay a lot of tax [BM laughs] right now the only reason I pay more tax is because the tax rate has gone up and the amount you pay goes up. Um but it’s a happy it’s, it’s a happy job for me um and when we have quite a lot of illness in in the family um and I’m the strongest healthiest person among us and quite often I’ve had to phone or as people have been coming in I’ve had to say look Jenny’s called I have to go to the hospital and that’s absolutely fine, um the people who come here know that and by the same token if they can’t come they don’t have to worry about it ever, ever, ever and if there’s a time when there’s only one person in the class, then I just look on it as that’s that was meant to be that that person needed to be here that day, um, and needed time on their own so it it works well it works well, bank manager’ll [sic manager will] never understand but [BM laughs] fortunately my husband does [BM laughs]. So um, it gives me a lot… it gives it, it gives me support as well as me supporting other people um and stretches me, you know, I’ve got one group of ladies there’s only one of them who’s not in their seventies and they’re called the ‘R and D’s’ and they’re called the R and D’s because they keep asking me to teach them things I’ve never done [BM laughs] you know and sometimes I think they delight in it. But it’s, it’s a lovely it’s a lovely um happenstance that that happens and people come together here who would never have met any other way and become fast friends, you know, very disparate people and it’s just exciting that’s just absolutely exciting so. ZA: So are you still constantly learning new techniques? BM: Yes. Yes I have to because I teach an 8 week class in Strathclyde twice a year and um very quickly… I always said that I would never teach a sampler quilt like that and I’m now on my third year of teaching Lynne Edwards Sampler Quilt [BM laughs] so one group had been coming for so long that they decided that they wanted a break from their sampler quilt, so I had to so I had to do sashiko and cathedral window, neither of which I’d done before and um both of which were quite challenging for me [BM laughs]. It’s all very well having the book and having a book as a, as a class resource as well and that that’s when I’m teaching from a book that book is the is um a requirement for the class but I can always find something else that I can bring to the table, um, especially from teaching so much quilt in a day and diagrams and things like that sometimes they’re they leave a lot to be desired and there’s nothing like actually having a demonstration, a demonstration I’ve learned, I’ve learned that people learn in different ways um and an awful lot of stitchers are kinaesthetic learners that you it doesn’t matter how well laid out the book is that they learn through seeing and doing and these are incredibly intelligent bright people and it’s just the way they learn. They find it more comfortable to learn with a physical demonstration um which is good for me [BM laughs], but um so that’s I still I have a I learn every I learn at every stage because very often I’m only one stage ahead [BM laughs]. ZA: Are there any techniques that you prefer over others? BM: I love sheer applique, I love creating embroideries that are done on water soluble films and things like that, that then become pieces that I can stitch down there are several pieces that I’ve done for the creative journey now which are basically one big piece of fabric that have things applied to them, usually because I’m running out of time, you know, and I admire the, the wonderful complex fractured piecing that um my fellow stitchers create, but I just never have the time to do a good enough job for it, so I’ll whack on some of this [BM laughs] sheer applique but even I mean that piece there, that’s one piece of fabric with my passport printed off onto fabric and then sheers down it. But I just love the, the way I started with a circle and took it out and took it out, um, and that’s, that’s the joy for me I can do that with sheer applique I could never piece that you know so it gives me the freedom to do more things than I could with piecing or I could easily with piecing, you know, I’m quite lazy that way so, so sheer applique’s my favourite. ZA: Which techniques did you use in this one? BM: Um, well I used the the centre of the triptych a trip around the world so that’s strip piecing and then there are there’s sheer applique and there’s thread painting, um, and there’s applique with, with metallic threads and there’s some embellishment on them with beads and with metallic threads and such like. I’m a real thread junkie. I will use as many threads as I possibly can. I just finished another trip around the world quilt to raffle for charity and I wanted to use eighteen fabrics in it taken from the rainbow and I used twenty threads in that for the quilting, so that the thread matched each of the different fabrics and I can do that [whispering] without having to go and buy any thread [BM laughs] it’s shocking it’s absolutely shocking the amount of thread I’ve got so lots of quilting sheer applique [BM laughs] you know any excuse to put more stitching [BM laughs] but um no that’s er those are my favourite things I really like quilting and sheer applique and [whispering] thread… thread [both laugh]. ZA: Do you have a particular um preference in terms of fabric? BM: Um apart from the sheer applique I use cotton all the time. I love batiks, batiks are definitely my favourites um whether they are printed or [inaudible] mottled solids or whatever I am totally besotted with batiks um and I’ll I have a whole shelf in there that’s just pieces of batik you know and that doesn’t include what’s on bolts, so yes, I love batiks [BM laughs]. ZA: Do you have a particularly process for finding them or do you always go to the same place? ZA: So you buy fabrics before having an idea of, of how you’ve going to use them? ZA: I don’t remember either [both laugh]. Where do you get your inspiration from generally for making your stuff? BM: Um, well um with the creative journey Pat gave us, er, the first one I did it was a poem er two lines out of the calendar of kings and then the next one it was a title festival city and then we had just a word ‘reflections’ and we were told that it could be either reflections and thought or reflections and any other way of reflections and then we were back to a poem and then we came back to the word ‘freedom’ the one word ‘freedom. Um so those are very loose ways, apart from the ones that are tied to poems, where you’ve got very definite things that you that for pictorial quilts you have to work in. But in my case I’m a bit of a multi tasker and I think deep thoughts about my family while I’m, while I’m doing the quilts um all of the quilts that I’ve designed tend to relate to my family or something that’s happened like the wee green one behind you, um, the Celtic one, um it’s a pattern called [inaudible 0:33:19-0:33:20] knot but round about it I’ve embroidered the Celtic prayer for peace and that was the first piece that I did after breast cancer surgery so um so lots of… um, it’s mainly thinking about family and thinking about relationships and working, working designs roundabout that, um, but still in the case of the ones that related to poems by George Mackay Brown, um, master maker has I’ve made a mandala of the tools that are described for the different trades and crafts people that he describes in I, t but actually as I was making it I was thinking my husband has all of those out in his garage you know this is really about him, you know, and that takes me in to where I need to be, um, because I don’t have any art training, you know, that’s I can’t go off piste, you know, I’m very stuck in this in this way of thinking, you know, so that’s where I get my inspiration from it starts out with a word but it always comes back to family [BM laughs]. ZA: so what about the triptych which started from family, how did you kind of come up with the process…[BM: Well…] of the design? ZA: And what will you do with them when you finish them? Will you keep them or? BM: Um I don’t know, I don’t know um. If Jack wants them Jack can have them, but Jack will be much happier I think with… he, this, this was Jack drawing um I was sewing I was sewing something and Jack was drawing me sewing [BM laughs] and he’s drawn him drawing me sewing [both laugh] so I think that’s, that’s much more his thing his cup of tea he’s gonna [sic going to] be like Catherine he’ll have no soul for this at all. I made a book for my son for his, he wanted, um, for his 27th birthday he wanted something that I’d thought about Mum not a not a gift voucher or something. So I’m I made a book with photographs and everything in it and Catherine took one look at it and she said ‘you know never to make anything like that for me Mum’ [BM laughs]. And I think Jack’s gonna [sic going to] be a bit like that [BM laughs] so. ZA: Well good to know these things [ZA laughs]. BM: Yes [both laugh]. It is good to know that I’m making it for me, you know [BM laughs] and don’t care if they have no soul for it [BM laughs]. ZA: But you have quite a few wall hangings around don’t you? BM: Yes, yes a lot a lot um not many bed quilts um but I started quilting to cover the walls because the walls in this house were so big and we couldn’t afford to buy paintings and at that time you couldn’t even afford to get photographs blown up you know, so quilting started as a way to cover the walls, you know [BM laughs] still goes on now hey hanging wall hangings are good because they’re teachable sizes you know as well um they’re not too expensive for people to buy fabrics for, um, and I just like them you know I, I it’s when in doubt make something that’s A4 size [BM laughs]. You can always get away with that [BM laughs]. So erm but yes I have a lot of a lot of wall hangings there’s a lot under the table as well [BM laughs] um, but those are all samples [B and Z laugh]. ZA: And do you have any quilting aspirations like any technique or anything you’ve always had in the back of your mind that…for a future point? ZA: Do you think your grandmother’s genes are finally coming through? BM: Yes, yes they definitely are um and I think that the, the textile part of it, the fact that we come from… when I was growing up every little girl was taught to knit you know and knitting was just I’ve got a lap bag because my gran would stand and do another row of knitting whilst she was waiting for the potatoes to boil and things like that. So that we’ve, we’ve always been working with, with wool or fabric or something even my father was a carved wood and my husband’s an engineer who loves making things with wood and his father was a scientific instrument maker. So, so there’s there is a lot of of making in our family in our… in both of our families and although my kids don’t really I think it’s a different life, a different way of life now um and everybody people don’t have as much um time or necessity to make things. So I think that that this feeds that need to you know I don’t actually need to quilt I don’t actually need wall hangings and things but I need to make them you know, so, yeah. ZA: And what happened to your grandma’s quilts in the end? BM: I don’t know I’ve got she because I was 3,000 miles away and her house was broken up she went into residential care and such like, but I mean I have three aunts, her three daughters and many cousins, so I know that they would that they’ll have gone to within the family and things, but they were none of them precious they were all utilitarian on the beds washed and worn and worn out, so I wouldn’t be surprised if there were none of them by the time she did die. Um my kids are going to have to think [BM laughs] I think my, my quilter friends are going to have to clear the house, you know [BM laughs] but I don’t think there would be room in any of my kids houses for, for the things that I’ve made and certainly not for my stash [BM laughs]. BM: Well right now I’m in the middle of finishing off 96 dentist coats [BM laughs] so um… but for the play we’re that I that I make for, um, that was designed for children with special needs to be integrated into role play and things so that’s, that’s the only thing that I’ve got on right now. But I’ve got about 20 sampler blocks to finish by hand to be able to teach people how to put them together and quilt them at Strathclyde, hopefully in September. Um apart from that I just finished a piece for the Chinese whispers for the Glasgow Gathering, a small piece, and I recently did the a double bed size quilt for to raffle for Chromosome 18 Europe. I don’t have anything on the go apart from that. But I have got that sampler quilt to finish I, I really have to get that done, I really have to. I bought, I brought fabric back from the states to, to use for in the background to just give me a final push [BM laughs] to get it going so, yeah that’s, that’s really all just now. ZA: You seem really surprised [BM: I am!] Do you normally have more? BM: I am, you know, yeah, I do. When I… because I’ve been on holiday and because it was a rush up until holiday to finish the Chinese Whispers piece I and I’ve been doing other things since I came back it must be about a month and that’s a long time for me not to been… not to have done any quilting but it is it’s about a month to five weeks since I’ve done proper quilting, you know, but you’ve just put me in the notion to go do some [BM laughs] now that I’ve realised that [BM laughs]. ZA: So your preference is for machine? BM: Yes. Yes it is [BM laughs] yes it is. ZA: Just because of the ease of it or? BM: Yeah when the children were small um it was my way of, um, getting peace, you know, I would go in there and sew and they would all watch television with their Dad and I didn’t mind what they watched and they knew that it didn’t matter what they watched [BM laughs]. I wasn’t gonna [sic going to] bother them because they weren’t gonna [sic going to] bother me [BM laughs]. So um it er the sewing machine was a place of peace, you know, [BM laughs] so I think that that’s probably why it’s it still is um I just love my sewing machines [both laugh] I don’t mind hand quilting but I love my sewing machines. ZA: And when you have the classes are they all by machine as well? BM: Most of them are yeah. Um even the, er, there were three ladies four ladies who have been um students at Strathclyde started off as students at Strathclyde with me who now come to class here as well as going to Strathclyde [BM laughs] you know. So they do their they have their hand work that they do at Strathclyde but they come here on a Monday evening and they sew other things you know with their machines and things, so, which is which is lovely you know it’s very it’s very much fun [BM laughs]. ZA: What’s the kind of demographic of people that you teach? BM: Um mostly um forties to seventies, um as I’ve got older the classes seem to, the people who come to class seem to get older as well. Um but when I go out to teach there are more younger, younger women um in other groups in their thirties and such like. I don’t tend to get many teenagers or children in my classes, um, but because it’s quite an expensive hobby you have to have some disposable income and therefore most of the people who come are, um…. they don’t have a lot of they don’t have young children except for grandchildren um, so I have a lot of grandparents who come and grand grandmothers who come um but no not, not an awful lot under forty, you know. There have been um I mean there’s, there’s one young lad that we made his cot quilt for and he’s now thirteen, fourteen there have been two girls who have had their had babies while they were coming to class um but they’re now in their fifties as well [BM laughs], forties and fifties as well. So that’s the age group really that I find comes to class here. ZA: Seems like quite the community. BM It is it is it definitely is [ZA laughs] you know it really is um I’m very lucky in that I am in amongst all of these different disparate groups and er Bonnie’s workshop in Twechar has just the nicest people come around here I’m just so lucky, so yeah. ZA: Okay well um any final words about quilting? BM: No I think I must have talked you right into the ground [BM laughs] I can’t imagine why anybody would not want to do it, you know, um it literally feeds the soul, you know, and that’s all there is to it just feeds my soul [both laugh]. ZA: That’s probably a nice place to end it on. ZA: Thank you very much.